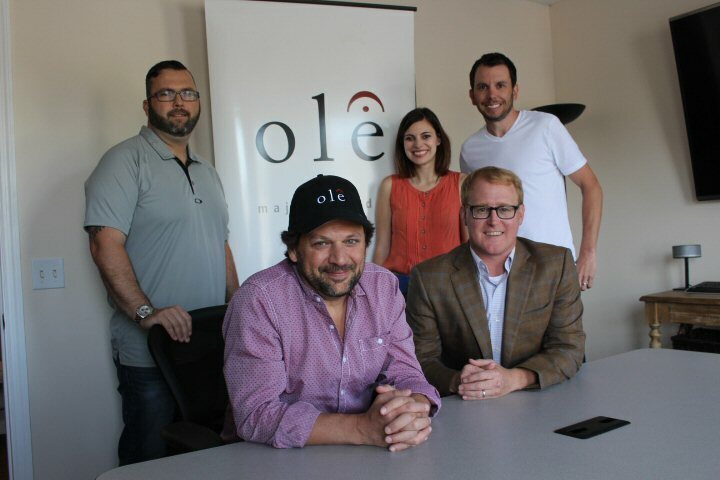 TORONTO, ONTARIO--(Marketwired - June 22, 2015) - ole, the world's fastest growing independent rights management company, has extended its deal with long-time songwriter Marty Dodson, who joined the company back in 2010 as part of ole's acquisition of the Blacktop Music Group. The new agreement covers worldwide co-publishing for Dodson's future songs and exclusive administration of his digital video rights. Throughout his career, Dodson has written several #1 songs on the Billboard Country Chart, including Billy Currington's "Must Be Doin' Somethin' Right" (which spent two weeks at the top) and "Let Me Down Easy" as well as Kenny Chesney's "Everybody Wants to Go to Heaven." "Marty has been an invaluable member of ole's songwriting team since he came onboard with Blacktop Music, and we're happy to continue that relationship," said John Ozier, General Manager of Creative in Nashville for ole. "ole is dedicated to expanding our robust, worldwide catalog of top-shelf music, and songwriters like Marty who can both write great songs and provide guidance for our newer artists are crucial to the completion of that goal. We look forward to hearing what he comes up with next." "ole and Robert Ott are among the most visionary publishers in the world, and I'm excited to be a part of such a dynamic company," said Dodson. "There is no place I would trust more to promote my music." Dodson wrote his first Top 10 single in 2001, landing Rascal Flatts' hit song "While You Loved Me" at #7 on the U.S. Hot Country Songs Chart. He then went on to work with a veritable who's who of country musicians, including Carrie Underwood, Kenny Chesney, Emerson Drive, Julianne Hough, Bucky Covington, and Darryl Worley, among many others. More recently, he penned Frankie Ballard's "Tell Me You Get Lonely," which reached the Top 40 on the Billboard Country chart, and produced two songs with rock band Saving Jane in 2009. His song "Bounce," recorded by Cho Young Pil, won Song of the Year at the Mnet Asian Music Awards in 2013 and the same award at the 2013 MAMA awards in South Korea. ole is one of the world's foremost rights management companies with investments of over $400M in music intellectual property (IP). Founded in 2004, with operations in Toronto, Nashville, New York, and Los Angeles, ole is engaged in IP acquisitions, creative development, and worldwide rights management. The ole catalog includes over 45,000 songs and 60,000 hours of TV and film music across all genres. Copyrights under ole's control include songs recorded by artists such as the Backstreet Boys, Beyoncé, Blake Shelton, Britney Spears, Carrie Underwood, Eric Church, Jay Z, Justin Timberlake, Kelly Clarkson, Madonna, Michael Jackson, One Direction, Rihanna, Rush, Taylor Swift, and Timbaland. ole controls substantial A/V music and secondary rights including catalogs from Sony Pictures Entertainment, DHX, MGM, Miramax, Nelvana, and Nu Image/Millennium. MusicBox, the Production Music division of ole, provides quality content and service to creators in all media with over 150,000 tracks in its library. ole is committed to the creative development of its 100+ staff songwriters, legacy writers, and composers and adding value to our catalogs and client catalogs. Current ole writers include Rush, Timbaland, Tyler Farr, Josh Dorr, Gord Bamford, Brett Jones, Dave Turnbull, Jeremy Stover, and Marty Dodson. ole has ongoing Ventures with Last Gang Publishing, Roots Three Music, Jackoby Publishing, and most recently, ole-bluestone Publishing, ole's venture with global hitmaker Timbaland. ole is proud to be associated with its bank partners SunTrust, JP Morgan, CIT Finance, Fifth Third Bank, Avenue Bank, City National Bank, and OneWest Bank. ole is committed to being the world's best and most innovative Rights Management Company and the preferred destination for IP Investors and Creators in all Media. To view the photo associated with this press release, please visit the following link: www.marketwire.com/library/20150619-olemartydodson800.jpg. Back, from left: Randall Foster (ole, Sr. Director, Creative Licensing), Emily Mueller (ole, Creative Manager), and Ben Strain (ole, Creative Director). Front, from left: ole songwriter Marty Dodson and John Ozier (ole, GM Creative).